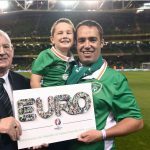 FOUR-YEAR-OLD Cian Prendergast of London Republic of Ireland Supporters Club (RISSC London) is among a selection of fans to be presented with a commemorative plaque at this week’s World Cup Qualifier against Georgia at the Aviva Stadium. The UEFA Executive Committee have decided to give an award to the Republic of Ireland for the outstanding contribution of their supporters in making Euro 2016 a success, with an array of hand-picked fans set to accept the accolade. 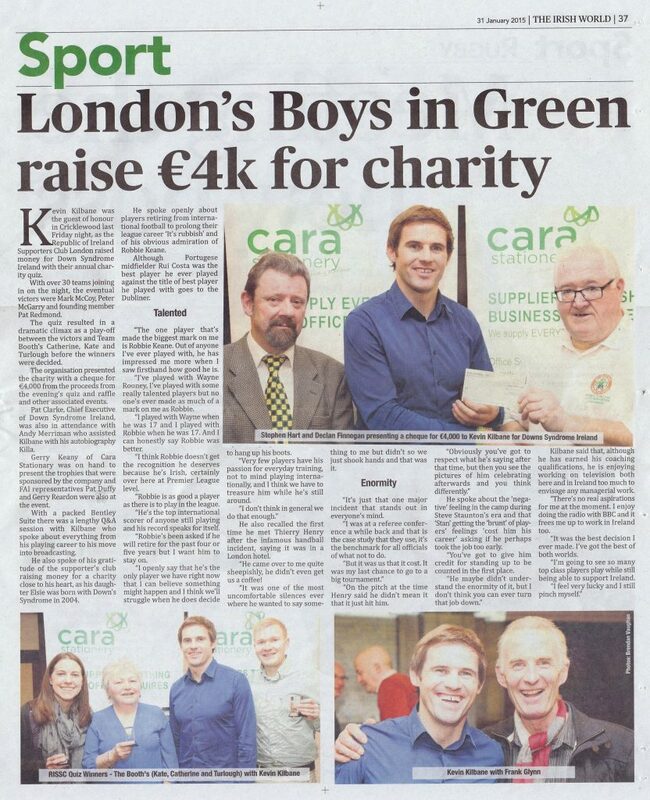 Cian and his father Martin, who will also attend the presentation, are both members of London Ireland Supporters Club and regularly travel from London to Ireland games home and abroad, including the Euros. 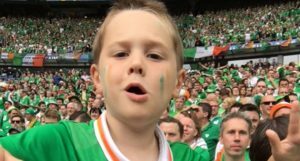 A video of London-born youngster Cian belting out Amhrán na bhFiann in the Stade de France ahead of Ireland’s Euro 2016 opener against Sweden went viral online during the summer. “He is really excited and hopes to meet Shane Long, his favourite player,” Cian’s father Martin told The Irish Post. “He’s been singing the ‘Shane Long’s on fire’ song ever since we told him of the invitation. He thinks he will score and Ireland will beat Georgia. 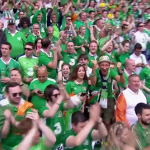 Football Association of Ireland CEO, John Delaney, hailed the impact of Republic supporters made at Euro 2016 ahead of this week’s presentation. LONDON-BORN four-year-old Ireland fan Cian Prendergast has become an internet sensation for his impressive rendition of Amhrán na bhFiann at Euro 2016. 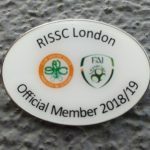 As a season ticket holder at the Aviva Stadium and a member of the London branch of the Republic of Ireland Soccer Supporter’s Club (RISSC London), Cian is strong contender for Ireland’s number one fan at the Euros. Such were his exploits at the Sweden game in Paris, the youngster was picked up by the big screens inside Stade de France as well as featuring on BBC’s end credits after the game. 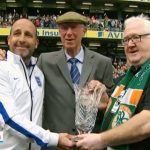 His father, Secretary of RISSC Martin Prendergast, is now on a mission to get the Ireland players to see his son’s passionate rendition of the national anthem ahead of Ireland’s last two group games against Belgium and Italy. 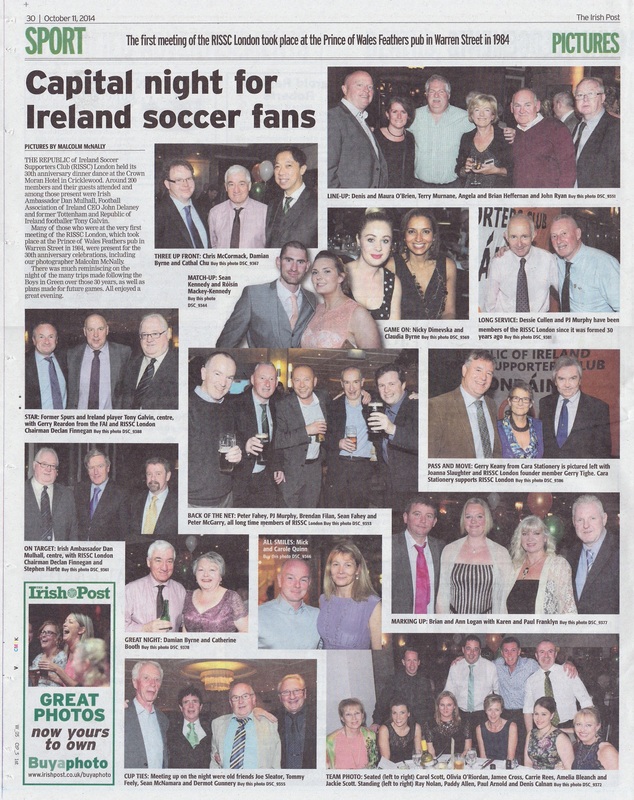 THE Republic of Ireland Soccer Supporters Club (RISSC) London held its 30th Anniversary dinner dance at the Crown Moran Hotel in Cricklewood. Around 200 members and their guests attended and among those present were Irish Ambassador Dan Mulhall, Football Association of Ireland CEO John Delaney and former Tottenham and Republic of Ireland footballer Tony Galvin. Many of those who were at the very first meeting of the RISSC London, which took place at the Prince of Wales Feathers pub in Warren Street in 1984, were present for the 30th anniversary celebrations, including our photographer Malcolm McNally. 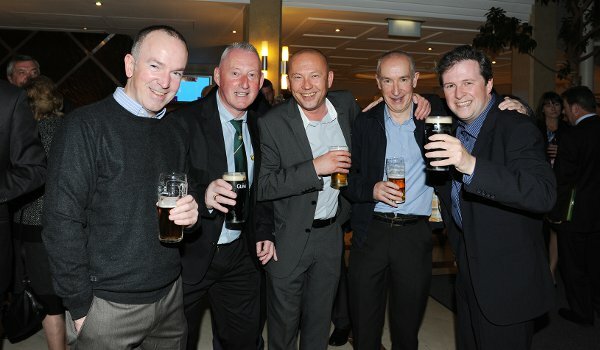 There was much reminiscing on the night of the many trips made following the Boys in Green over those 30 years, as well as plans made for future games. All enjoyed a great evening. 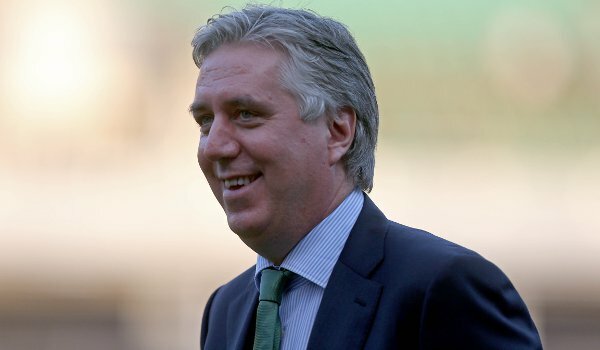 FAI BOSS John Delaney will be among the special guests at the London-based Republic of Ireland Supporters Club’s 30th anniversary celebrations later this month. A number of other special guests, including ex-Irish footballers and representatives from the Irish Embassy, will also be in attendance at the event on Saturday 27 September in the Crown Moran Hotel, Cricklewood, although no other names have yet been revealed. The event will include an evening of dinner, dancing and a charity raffle with the chance to win signed shirts. Guests will be treated to live music from singer Barry Owen. 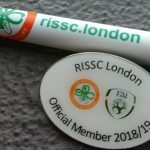 Club Secretary Martin Prendergast confirmed that 250 guests are expected to attend the anniversary celebrations of the RISSC, of which former Arsenal and Ireland player Liam Brady is Honorary President. The organisation was founded in 1984, and held its inaugural meeting at the Prince of Wales Feather Public House in Warren Street, London. The club is officially recognised by the FAI and aims to provide a forum for supporters of Irish football at all levels, from the grassroots to the senior international teams. In addition to supporting the national teams, the club sponsored then Under 8 side of St Kevin’s Boys Club in Dublin in 2000, with Ireland’s Robbie Brady and Jeff Hendrick two of the success stories who emerged from the youth team and entered professional football. The 30th Anniversary Dinner Dance will be in the Bentley Room at the Crown Moran Hotel, Cricklewood, London, NW2 on Saturday 27 September 2014. Tickets for the event were priced at £45 per ticket. Thousands of Irish emigrants will watch the national team play Croatia on Sunday no matter what time it is in their part of the world. CIARA KENNY found out where they will be watching the games, and what supporting Ireland means to them. The massive increase in the number of Irish people settling in Vancouver in recent years has led to a growing appetite for Irish sports in the city, but there was no club or venue dedicated to Irish soccer before Daniel Tinnelly, a structural engineer who moved from Dublin to Canada in 2009, decided to address the issue late last year in anticipation of the Euro 2012 finals. With permission from the Football Association of Ireland, Tinnelly set up the Official FAI Supporters Club of Vancouver last December, with the aim of creating a big enough group of Irish fans to fill a pub, and ensure there would be a venue where every Irish soccer match would be screened live. They have since teamed up with Mahony & Sons, an Irish bar at Burrard Landing in the city, which has now become the first FAI Supporters Bar of Vancouver. Every Irish match in the European Championships will be shown in the bar. The first game on Sunday will be a family event, with face-painting, drinks promotions and a raffle, and a $5 (€3.90) donation at the door will be split between three Vancouver charities with Irish affiliations, the St Vincent de Paul, the Irish Benevolent Fund and the British Columbia Cancer Foundation. The Ireland-Croatia match kicks off at 4.45am on Monday in Sydney. Gemma Callaghan (23), who moved to Australia from Cabra in Dublin last year, plans to stay up with a group of friends to watch it in one of the city’s 24-hour bars. Callaghan, who is a qualified secondary school teacher, now works for Taste Ireland, an online company importing goods such as Barry’s Tea, Club Orange and Tayto crisps for the Irish in Australia. 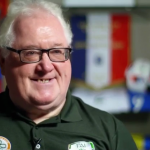 Boston publican Declan Meighan and his business partner Joe Dunne have been promoting the upcoming Irish matches since Ireland qualified for the Euros last November. They expect their two Irish bars, Lír and McGann’s, to be packed for all three games. “We have a clock counting down the days to when it all kicks off, it is a really big deal among the Irish community in Boston,” Meighan says. Meighan, who moved to Boston from Monkstown in Dublin in 1986, co-owns seven bars in the city, as well as the Front Lounge on Parliament Street in Dublin. 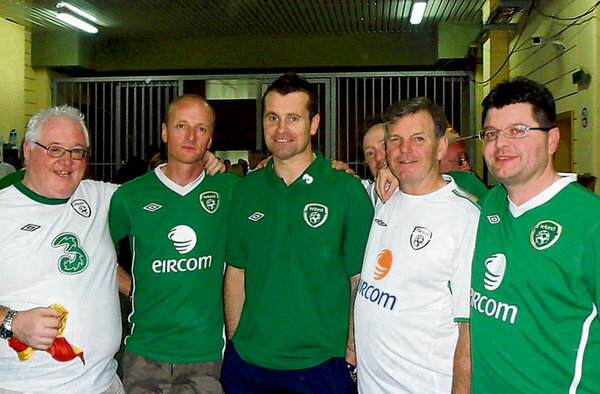 RISSC members with Shay Given after the qualification game in Macedonia in June 2011. Left to right are Declan Finnegan, Kevin O’Brien, Shay Given, Bernard O’Reilly and Stephen McNulty. Declan Finnegan, chairman of the Republic of Ireland Soccer Supporters’ Club of London (RISSC), is one of about 20 London-based Irish who have been to every match the Irish team have played in the Euro 2012 campaign so far. The RISSC in London has been going since 1984. They currently have almost 500 members, 175 of whom are travelling to Poland for one, two or three of the group stage matches. Finnegan has been living in London since 1971, and has been involved with the RISSC since 1989. “There are people who have been here longer than me in the club, and people who have only just arrived in the last year or so,” he says. “One of the strongest elements of the club membership is the second or third generation Irish, who are still die-hard Irish football fans. Some of them are more Irish than the Irish themselves. 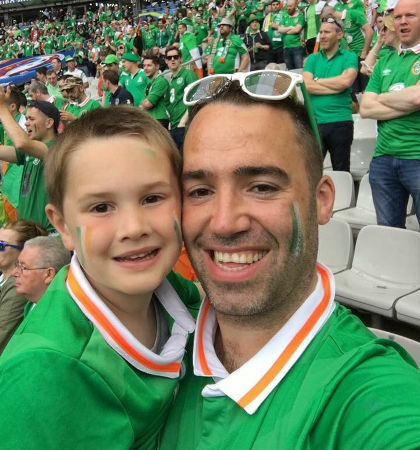 When the Ireland-Croatia match kicks off on Sunday, Ciarán Lowney will be boarding a plane with his Kiwi wife and four-year-old son in Auckland, bound for Toronto in Canada where they will spend a few days before travelling to Ireland for the first time in seven years. “When we qualified, I thought it would be perfect, that I would be home for all the Irish matches, but I’ll be on the plane for the first and in Toronto for the second, but we’ve already sussed out an Irish bar where we can watch the game there,” he says. The Irish community in Auckland will be watching too, but as the matches kick off at 6.45am, they will be celebrating over cups of tea rather than pints. Ciarán Lowney is involved with the Irish People Living in New Zealand social network. This article appears in the Life & Culture section of The Irish Times 8th of June 2012, and on irishtimes.com.